It is great being part of the science lifestyle because you get to look forward to cool astronomical and space events. It is even more fun if the event is well publicized in advance so the general public can take part in the experience. Tomorrow, Friday October 9, in the early morning hours around 4:30am PDT, is a great example. 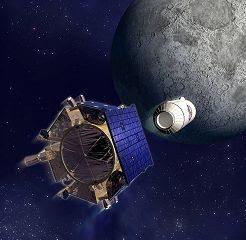 This is when the Lunar Crater Observation and Sensing Satellite (LCROSS) will propel a rocket and slam it into the moon in order to find possible traces of water. A watery moon could pave the way for a future lunar base that would need water and breathable air which could be derived from water. LCROSS launched in June and is now set to perform its experiment. LCROSS will send a Centaur rocket, a 5,200 lb. projectile travelling at 5,600 miles per hour, plunging into the 60-mile-wide crater Cabeus near the moon’s south pole (and dig a 13 foot hole in the process). Meanwhile, LCROSS will maneuver itself into position to fly through the dust cloud rising as much as six miles above the lunar surface. The debris will be analyzed onboard LCROSS to determine any water content. This extraordinary event will be carefully watched by observatories around the world along with the Hubble Space Telescope. Even amateur astronomers can take part in the viewing with a telescope having at least a 10-inch aperture. The project is managed by the Ames Research Center in Mountain View, Calif. and a crowd of thousands of science enthusiasts are expected for an evening of music and movies that will culminate with a live video feed of the impact. This kind of event is a perfect science-family activity, although getting the kids up at that hour may be a challenge. It will be well worth the effort however, especially if the presence of water is confirmed. Isn’t science wonderful? hi groupie, I LOVE the hubble and I am only 11 yearsold. Is that weird? UPDATE: originally thought be an experimental dud due to no visible plume emitted from the LCROSS crash into the moon. In recent days however, further examination of the video captured during the experiment, a mile-hight plume was detected. Scientists are now examining the data returned from the spacecraft prior to crashing. We will report all results here at soon as available.